Approaching the 10th anniversary of the “Miracle on the Hudson,” Pilot Chesley “Sully” Sullenberger and air traffic controller Pat Harten will meet at the finish line of the New York City Marathon. NEW YORK — The image is miraculous: Passengers standing on the wings of a US Airways jetliner as it floats down the Hudson River. Pilot Chesley “Sully” Sullenberger and air traffic controller Pat Harten are forever linked by the amazing water landing that saved all 155 passengers and crew after a double-bird strike damaged both engines on Jan. 15, 2009. Approaching the 10th anniversary of the “Miracle on the Hudson,” Sullenberger and Harten will meet at the finish line of the New York City Marathon. Sullenberger will put the finisher’s medal around Harten’s neck in Central Park on Nov. 4. Harten is a second-generation air traffic controller, following the path of his father and 36-year veteran, Patrick Harten Sr. The younger Harten attended air traffic control school in Alaska after earning a degree in chemistry from Stony Brook University. His father, who ran the 1985 NYC Marathon, introduced him to the sport. They started running together when Harten was 9, and he finished a half-marathon at 10. He’s also competed in three Ironman triathlons — a 2.4-mile swim, 112-mile bike and 26.2-mile marathon. 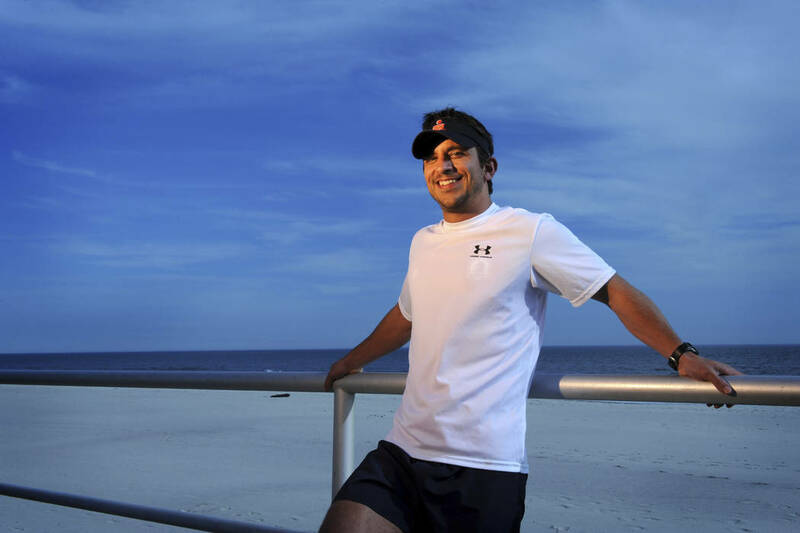 He’s training for first NYC Marathon and fifth overall, including two Boston Marathons. The bond between Harten and Sullenberger was forged on that 19-degree winter day. Flight 1549 left LaGuardia Airport and, shortly after takeoff, a flock of Canadian geese damaged both engines. Sullenberger asked Harten about landing at nearby Teterboro Airport in New Jersey, in case he got thrust back in one of the engines. 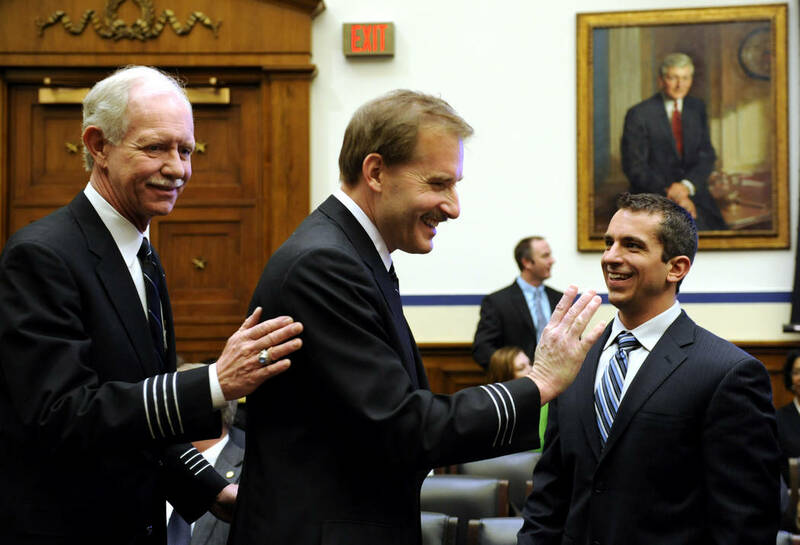 Sullenberger and first officer Jeff Skiles, who met three days earlier, went through the checklist of possibilities. “We had to collaborate wordlessly and quickly realized there were only three options,” Sullenberger said. “Two that we could not reach because we just didn’t have enough energy or enough altitude or speed. The only place in the entire New York area that we could make was the river. Sullenberger and Harten had about four minutes between the bird strike at 3:27 p.m. and ditching into the Hudson River at 3:31 p.m. Sullenberger credits four decades and “thousands of hours” of flight experience for the successful outcome. The first New York Waterway ferry reached the plane in just under four minutes, he said. “The fact that we, the rescuers and first responders, were all able to come together to rise to the occasion and make it our mission in life to see everyone was saved is something that will define the rest of our lives,” Sullenberger said. Harten thought all the passengers perished after he lost radar contact when the plane dipped below the New York skyscrapers. Protocol required quickly leaving his position, reviewing the incident and preparing an official statement. After about 45 minutes, a co-worker in the break room suggested someone should “probably go tell Patty that everyone is OK,” Harten said. “Somebody came down and said to me, ‘I think it looks like everyone made it.’ I thought they were messing with me at first. In my mind, I thought they had all died. Sullenberger requested the pilot union’s critical incident response team come to New York and provide survivors with a “road map” of expected symptoms — how the near-death experience would affect their thinking and sleep. “We all experienced PTSD,” the 67-year-old Sullenberger said. “It took a number of months to work our way through it. But people can be resilient. Harten had the support of wife Regina, mother Mary, three siblings and his father. “My dad could kind of help because he could relate to it more than the average person,” said Harten, who is approaching 20 years as an air traffic controller, working six days a week, up to 10 hours a day. Running also helped him cope, along with six weeks of therapy. These days, the 44-year-old Harten trains on the boardwalk in Long Beach, New York. He’s recently been slowed by leg cramps, but bikes to maintain his fitness. Whether he can “run a 3:20” or “walk after Mile 2,” Harten says he’ll get to the finish line. When he’s not outdoors hiking with his wife, Sullenberger speaks about air safety, talks to veterans about resources for PTSD and advises on design safety for driverless cars. The real passengers and crew will gather for the 10th anniversary at the Carolinas Aviation Museum, home to the reconstructed Airbus A320, in Charlotte, North Carolina.